I worked my tail off for nine months moving baggage in and out of planes in Tampa. My parents left me alone during that time. I think they could sense that I was managing, that I was starting to make better decisions for myself. Truth was, I still wanted to figure out a way to get from baggage handler to pilot. It had to be possible, I just didn’t know where to start, so I kept my eyes and ears open. And then one day I got the opportunity of a lifetime. My eyes got as big as saucers; I felt the same kind of excitement that I used to get during a big game in high school. I even got the tingles in my stomach that told me something good was about to happen. I think my grin was a half-mile wide, or maybe more. 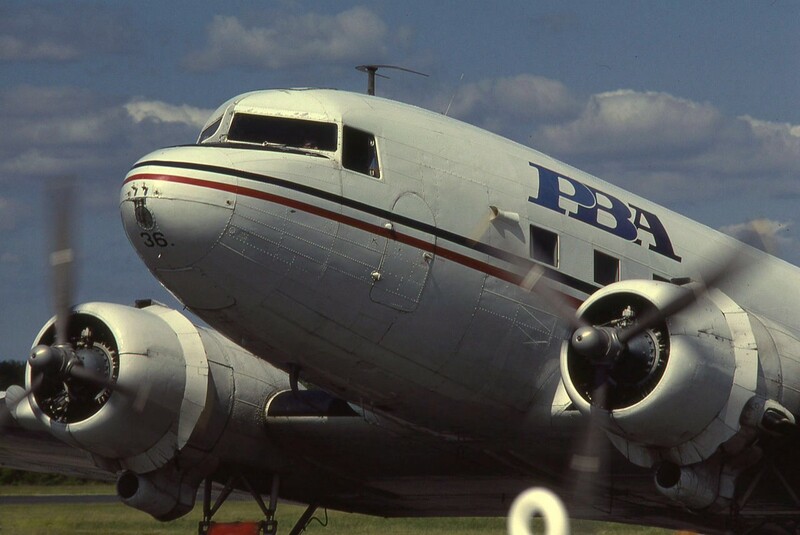 You have to understand, a DC-3 is not your run-of-the-mill airliner. It’s a twin-radial-engine beauty that has a little wheel on the back and looks like it would fit in flying formation with a squadron of P-51 Mustangs. The DC-3 is an airplane with a history — the military version, the C-47, was used to ferry supplies during the Berlin Airlift in the late 40s. And if you ever fly one, you’ll see that the DC-3 is a big, noisy tailwheel airplane with an attitude that flies as sweet as a Georgia peach with butterfly wings once you get it off the ground. All that I just said about the DC-3, hardly any of it is exaggeration. I love it that much. 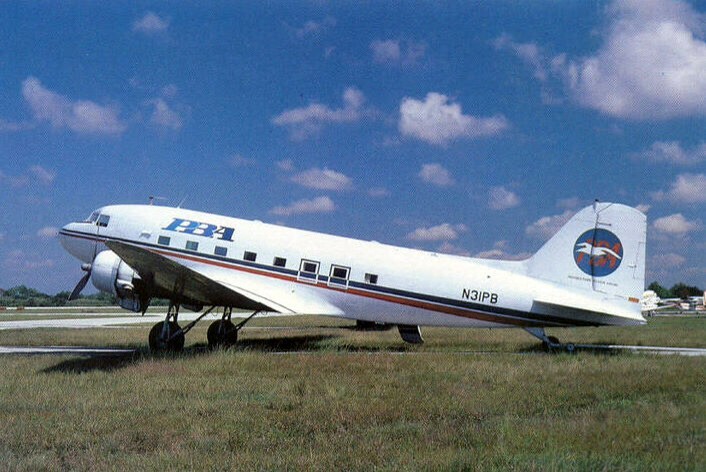 A DC-3 waiting for its next flight. Jake told me to climb in. I went in through a rear door and climbed uphill through the cabin aisle inside the DC-3, holding onto the seat backs for leverage. Jake motioned for me to to get into the right co-pilot’s seat next to him. I settled in and felt how worn and smooth the leather was. I felt the rudder pedals under my feet and understood intuitively that they were important in an airplane like this. Without thinking, I placed a hand on the yoke, and then I started to feel like a real aviator and the propellers weren’t even turning yet. Imagine: That’s what it’s like to sit in the cockpit of a DC-3. We hadn’t even gotten to the good part yet. Right. Like an old Plymouth…. “Jake,” I said. “I don’t know what a mag switch is.” I got the feeling he’d said the car thing just to mess with me. I moved the magneto switch, held it there for a few moments, and then Jake told me to let go of everything. His hands were moving on the primer and the throttle, and then the big old engine caught and came to life. It sounded like my old LeMans car without any headers on it. It vibrated, and I felt like it was the most powerful thing in the world. A mechanical rumble you could feel in your entire body. And it was at idle. “You want to start the other one?” said Jake over the roar. This time it was less mysterious. I knew where the starter was, where the mag switch was. We got the second engine rumbling and it was twice as loud in the cockpit now. Jake pointed out the gauges, showed me the oil temperature and the oil pressure; he said they looked good. I looked, tried to pay attention, but I didn’t know what I was looking at yet. There was a lot going on — the rumble of the engines, the static over the headset, the shaking in the cockpit. Everything was loud. “Put your hands on the throttles,” said Jake. It didn’t matter that we weren’t in the air. I had my hands full. I pulled the throttles back, afraid I was about to break something. Jake got on the brakes, hard. Then he told me to try again. I pushed on the throttles, trying to feel the balance between the engines, and we started to roll again, in a straight line this time. Jake told me where the toe brakes were on the rudder pedals. He told me to try them. When I did, I brought us to a controlled stop. I couldn’t believe that I was the one controlling this aircraft. Jake called ground control on the radio; he told them we’d be taxiing to parking. Then he told me to let off the brakes and we started moving again. This being my first time at the controls of an airplane, I made us meander along the taxiways, the DC-3 making lazy, drunken S-turns as we rolled. I was sweating. I didn’t want to screw this up. Jake was smiling, saying things to the folks on the radio. He looked calm. I didn’t know what to say but thank you. I called my dad after that and told him everything about it. I told him I was going to be a pilot, that I knew I could make it happen. My father made me another deal. He told me that if I got my private pilot’s license on my own, if I made that commitment and followed through, that he would fund my instrument, commercial, and multi-engine ratings. I’d need those ratings to become a working pilot. I signed up for flight lessons at a nearby flight school, flying two-seat Grumman American AA-1Bs and four-seat Piper Comanches on my time off from work. I showed up at the flight school with my long hair, macho 1970s outfits, and cowboy boots. Not exactly the cookie cutter image of an aspiring professional pilot. I also got a second job as a bouncer at a bar, working nights. I was working hard day and night, but I was doing it so I could fly. I still remember the feeling of flying the private pilot checkride, also known as the Practical Test. I remember how the FAA examiner called out the maneuvers and the simulated emergencies and told me to do short and soft-field takeoffs and landings. I remember hearing him tell me you’re a pilot now at some point near the end of the ride, and how I felt like a real aviator as I taxied us back to the tie-down spot. I wasn’t a student-pilot anymore. I was a pilot, and proud to be one. I was a bona-fide aviator. Not long after the checkride, in my wallet, I had a little laminated card from the FAA with my name and date of birth printed on it. That was my Airman Certificate. When I told my dad, he told me he was proud. That’s fuel for a son. That’s the stuff that keeps you going. [Jason has over 35,000 hours of flying under his belt. His ‘office’ is the left seat of a Boeing 737; he’s a Senior Check Airman with Southwest airlines. In his time off, he might be flying one of his seaplanes or even scooting around the country in his beautiful little J-3 Cub. This story is an excerpt from a book he’s planning to release when he retires in a few years.